Have you heard about Topgolf, Huntsville's premier entertainment and event venue? 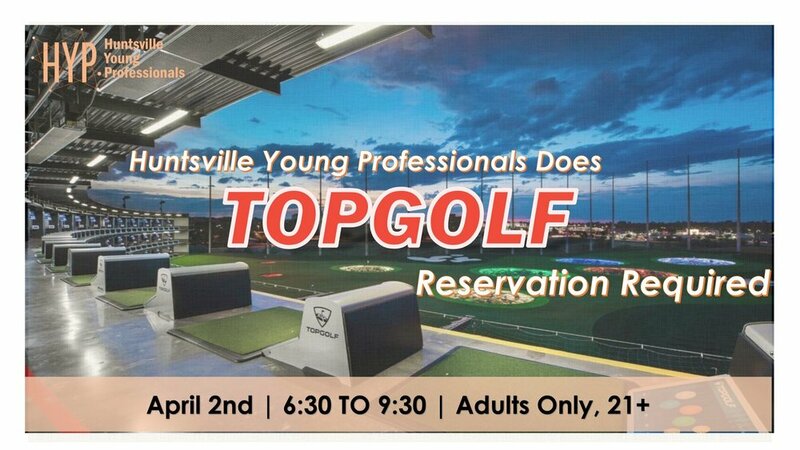 Huntsville Young Professionals is partnering with Topgolf so that you can experience the fun for yourself! Join us on Tuesday, April 2nd from 6:30 pm to 9:30 pm at Topgolf Huntsville. Please arrive between 6:30 to 7:00 to check-in, buy membership cards, order food/ drinks, and get separated into different bays. From 7:30 pm to 9:30 pm we will get to experience some of Topgolf's games for ourselves! This event is for guests ages 21+. There is a $10 reservation fee required to hold your space for this event! Once you attend the event we will refund that money back to you. This event is limited to the first 36 guests so sign up quickly for your spot! First come, first serve!